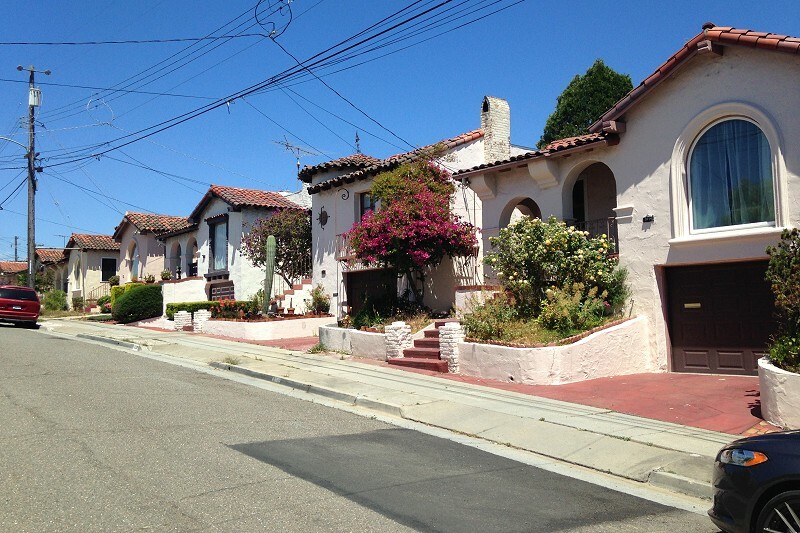 The 3700 block of Elston Avenue that’s just behind the Altenheim is an exquisite set of homes, each custom-built in the mid-1930s in the same Spanish Revival style and with a streetscape to match. The first time I came upon this street, an old-timer came out and regaled me with the story of the developer who assembled this set of houses, building them one or two at a time. Like Henry Ford’s Model T, you could have whatever you wanted as long as it was beige stucco with a red tile roof. I wish I could recall the developer’s name, but perhaps one of you can identify him in a comment. Elston Place is in the middle of the block, offering views downtown. 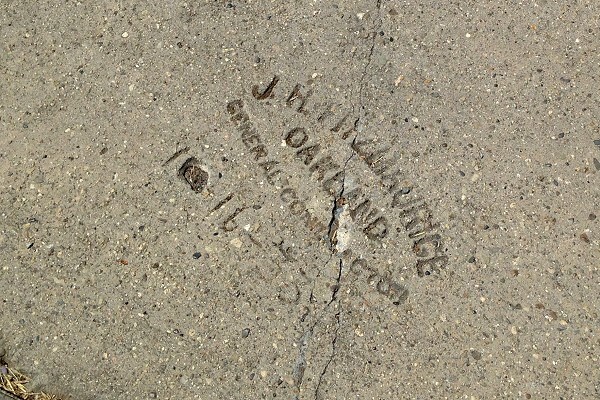 The street corner here has one of the details that adds to the block’s charm, a dated Fitzmaurice mark from 1933 when the base sidewalk was laid down. Here’s another view farther up the block that includes the driveways. Look close (all these images are clickable, as usual) and you’ll see a familiar triangle there. 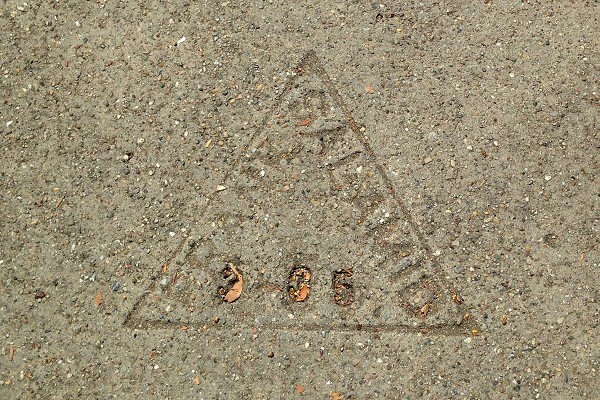 Yes, good old Frank Salamid did every driveway on this block. Thus every artisan who made this block added to the rare degree of unity and consistency that makes well-preserved Elston one of my very favorite Oakland streets. This entry was posted on 21 July 2017 at 8:02 am and is filed under Streetscape. You can follow any responses to this entry through the RSS 2.0 feed. You can skip to the end and leave a response. Pinging is currently not allowed. Interesting post! 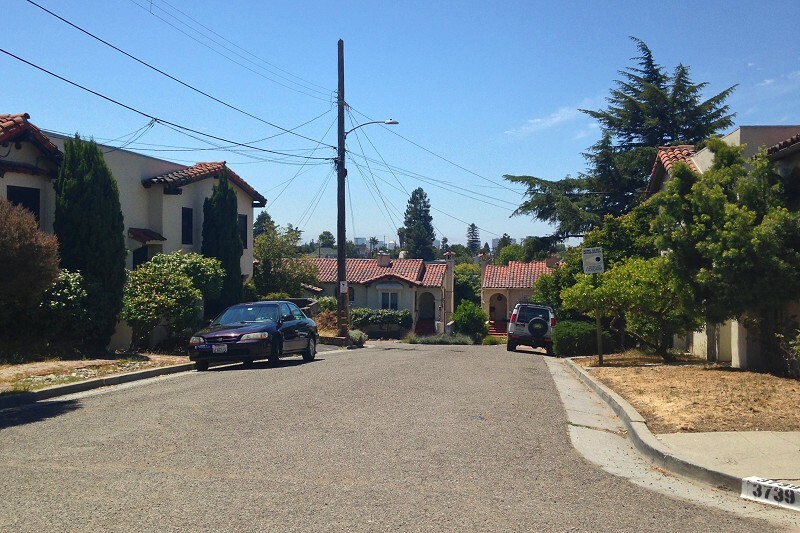 This would be a great street to include on an Oakland Urban Paths walk. I’ll suggest it. LIKE THE NEIGHBORHOOD CONNECTION TO THIS. There’s another one I always wondered about off 35th Ave on Jordan and Victor. 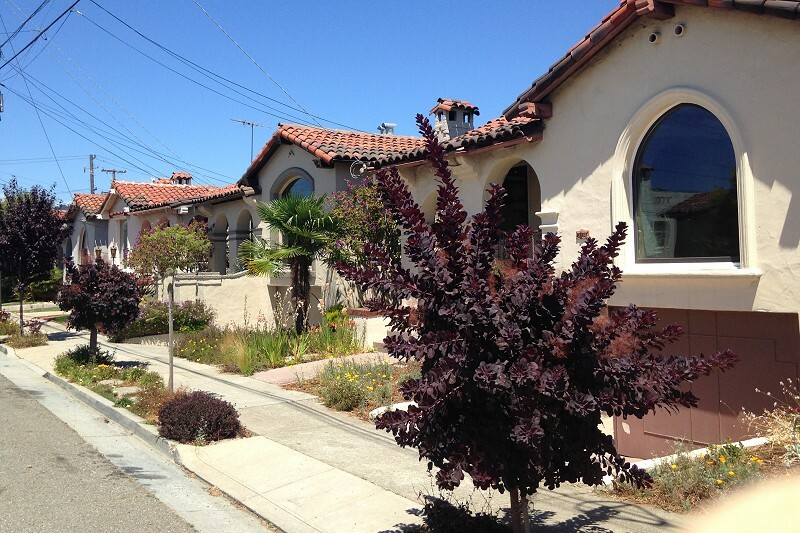 Beautiful little neighborhood of red-tiled roofs and very similar designs. Ever been?